I am pleased to announce the debut of my publisher's blog on SUCCESS.com. Every day I am honored to meet, interview and review the works of the greatest leaders and achievers of our time. On this blog I will share with you little-known secrets, musings and behind-the-scenes insights to these very interesting personalities. Because SUCCESS magazine is the centerpiece of the entire personal achievement dialogue and industry, we review, sort and attempt to synthesize the absolute very best there is and deliver it to you inside the pages of SUCCESS each month. In this process I personally pick up some incredible achievement tips, ideas and strategies (which sometimes don't make it into the magazine) that are making a huge difference in my own life. This blog is where I can pass along those unique insights to you. This blog will be your insider's guide into the world of business, wealth, well-being, healthy relationships and philanthropy. It's an open forum to personally enter a discussion with me on a variety of topics and become an active participant in the issues related to your individual growth and success. Don't miss out on a single post-subscribe now and join thousands of others with the advantage on success. Tune in to CNBC, this THURSDAY, 10 p.m. EDST/9 p.m. CDST/7 p.m. PDST (check local listings) to catch me on the Donny Deutsch Show. The show topic is "How to Make Good Money in Bad Times” Plus, get key tips and entrepreneurial ideas about how to recession-proof your income. Their demographics: CNBC airs in 95 million homes in North America, 397 million homes worldwide. An appearance on CNBC reaches one of the most influential and affluent audiences in television. A recent CNBC Viewer Tracking Study found that the majority of top management executives watch CNBC and that the average net worth of our viewers is $2.7 million. SUCCESS Symposium II - A Magical Event! On July 12, over 3,700 achievers from 20 countries gathered in Anaheim, California for the second SUCCESS Symposium. Those in attendance experienced an truly magical day filled with incredibly insightful and powerful messages LIVE from renowned authors, speakers and presenters such as Jim Rohn, John Maxwell, Denis Waitley, Bill Phillips, Ron White and many more. 27 Resources To Accelerate Your Success? Some might surprise you! New York, NY (June 30, 2008) – A new survey conducted by SUCCESS magazine, the preeminent publication for personal achievement, found that nearly 20 percent of Americans openly admit to living a life without future goals. “We were surprised to find that nearly one in five Americans answered ‘No’ when asked if they had life goals,” said Darren Hardy, publisher and editorial director of SUCCESS. “This admitted lack of direction encouraged us to create our list of 27 resources that could help get people on the path to success. The No. 1 resource—a personal list of life goals. In a subsequent survey, which generated 2,834 responses, the majority (33 percent) of respondents said that their highest priority is to run their own company. Coming in a close second, 31 percent stated that their top goal is to retire early. These were followed by raising a family (16 percent), purchase a dream house and get in shape (both 10 percent). Mentor/Coach—those who seek excellence have a coach. Even Tiger Woods, who has written books on how to master you golf swing, has a swing coach. Personal Reading/Listening Library—being a consummate student can be the single greatest factor contributing to your success. News Aggregator/Reader (RSS)—Sites like iGoogle and Bloglines.com allow you to create personalized news feeds so you can stay current on happenings in the world. On-site or Virtual Assistant—when growing a business your time is too valuable to get bogged down with lesser-skill functions, so get a part-time or virtual assistant through AssistU.com. The SUCCESS magazine surveys were conducted on SUCCESS.com among a national sample of 1,200 and 2,834 Americans, respectively. The margins of error are +/- 2.83 percent and +/- 1.84 percent, respectively, at a 95 percent confidence level. SUCCESS is designed specifically to serve the growing entrepreneurial and small-business markets. SUCCESS features personal-development thought leaders, CEOs, entrepreneurs and other achievers who offer practical advice, ideas, tips and training on leadership, goal attainment, time management, selling, motivation and more. Bound into every issue is also a free DualDisc™ (CD & DVD in one) featuring exclusive compilations of success training from leading personal-achievement experts. 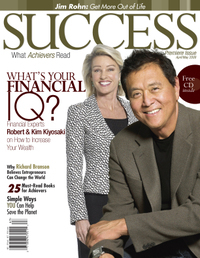 SUCCESS retails for $5.95 and is distributed nationally with an initial printing of more than 1 million copies. Visit www.SUCCESS.com for more information. 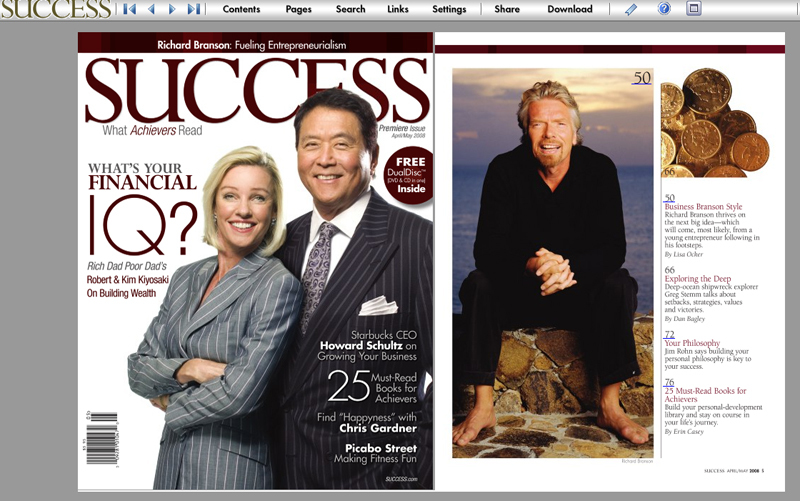 The new issue of SUCCESS is on newsstands now! David Bach, Jillian Michaels from "Biggest Loser", Harvey Mackay, Terri Sjodin and General Colin Powell on giving back. Fantastic issue... indeed our BEST YET! Wanna Meet 3,000+ Successful and Motivated Achievers? How do I meet other ambitious and like-minded people to network, share ideas, find mentors and potentially create business partnerships? SUCCESS magazine is hosting the second SUCCESS Symposium in Anaheim, California July 12th, 2008. The BEST issue of SUCCESS yet! Destined to be a collector’s edition, this issue of SUCCESS identifies and profiles the 50 Greatest Entrepreneurs of All Time – what they did to achieve extraordinary success, what you can learn from them, and what you can apply into your own life and business strategies. Packed into this 112-page issue of SUCCESS you will also find additional ideas, inspiration and tips you can apply in your relationships, health and well-being, sales, leadership, wealth-building and entrepreneurial adventures. Also included is a DualDisc™ (CD&DVD in one) with incredible content from personal-development icons – Jim Rohn, John Maxwell, Paul J. Meyer, Paul Zane Pilzer, Kim Kiyosaki and W. Clement Stone. Don’t miss out. Get your copy today. It’s What Achievers Read! CW11 in New York City - largest network in the City. Please pass around to all friends, foes and family – access is FREE. You can also subscribe to the print edition here: SUBSCRIBE It’s hard to read online while on planes, in waiting rooms, on the beach or out at the pool! SUCCESS magazine - 1 Million Copies Sold! WITH 1 MILLION COPIES SOLD! DALLAS Texas— With its nationwide debut on March 4, 2008, the new SUCCESS magazine will launch as one of the largest magazine rollouts in publishing history with more than 1 million copies having been presold and more than 50,000 being distributed nationally on the newsstand. The successful launch response is indication that the magazine is timed perfectly for a nationwide demographic seeking a reliable personal-development resource. The parent company of SUCCESS Media, which publishes SUCCESS, is VideoPlus, a marketing and communications company supporting the direct selling industry. In anticipation of the all-new SUCCESS release, many of VideoPlus’ clients enthusiastically promoted the magazine, which additionally helped create this extraordinary success. This pre-eminent personal achievement magazine will be initially published bimonthly, then SUCCESS will increase its frequency to monthly in September 2008. The first issue will carry advertising from Capital One, Neat Receipts, 1&1 Hosting, Hilton, QuickBooks and others. 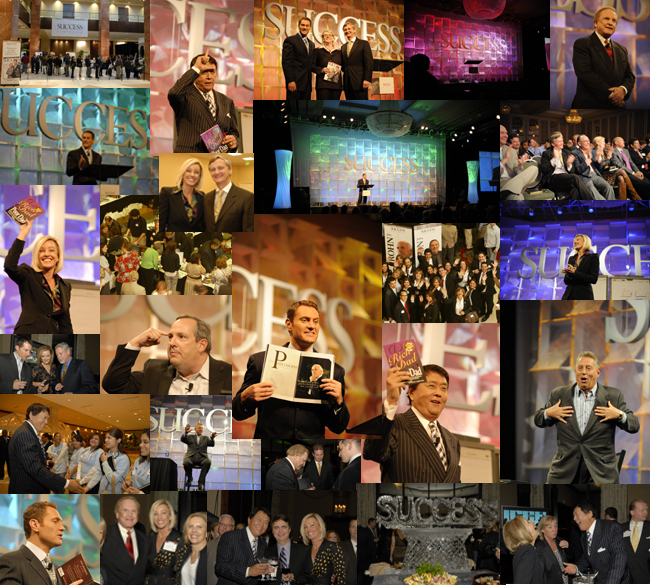 SUCCESS will host an official launch event, the SUCCESS Symposium, to a sold-out audience of 1,200 people on February 23, 2008 at the Hilton Anatole in Dallas, Texas. 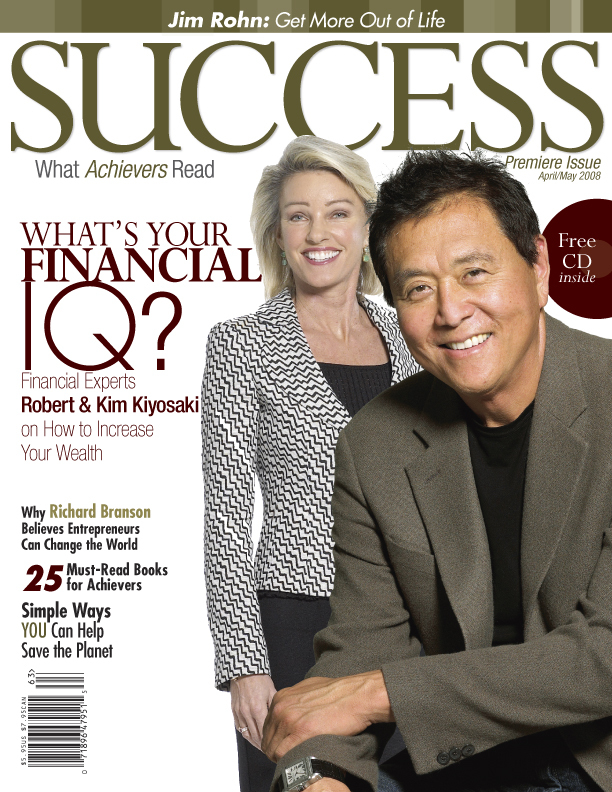 The event will feature first issue cover profiles Robert and Kim Kiyosaki along with leading personal development experts Jim Rohn, John Maxwell, John Addison and Ron White. SUCCESS Media also recently acquired the domain SUCCESS.com which will be the home of the SUCCESS magazine Web site. SUCCESS is designed specifically to serve the growing entrepreneurial and small-business markets. SUCCESS features personal-development thought leaders, CEOs, entrepreneurs and other achievers who offer practical advice, ideas, tips and training on leadership, goal attainment, time management, selling, motivation and more. Bound into every issue is also a free DualDisc™ (CD & DVD in one) featuring exclusive compilations of success training from leading personal-achievement experts. SUCCESS retails for $5.95 and is distributed nationally with sales of the first issue being in excess of 1 million copies. Visit www.SUCCESS.com for more information. Featuring Robert & Kim Kiyosaki, John Maxwell, Denis Waitely, Ron White and John Addison... and a sold-out crowd of 1,400 enthusiastic success-minded achievers! Have you seen the inspirational movie we produced for SUCCESS magazine? Dallas, Texas (December 20, 2008) – New Year’s is a time for resolutions, and according to SUCCESS there is no better time design the person you want to become and the life you want to live in 2008. Publisher and Editorial Director of SUCCESS magazine, Darren Hardy, offers the following advice on how to make 2008 your best year ever! 1.Decide to be Successful – Success is not a dream, hope or fantasy; it is a decision. Make the decision to change, improve and act on your ambitions. 2.Design your Best Year Yet – As an architect would design a skyscraper, write out the goals, plans and actions it will take to achieve the life you want to live. 3.Identify Your Passion - What are your unique interests, talents and gifts? Passion attracts success. Find what you love to do - you will never “work” again. 4.Program Yourself for Success – You will see, perceive, expect and create what you think about. To program your mind for success – read watch and listen to materials that will support your success. 5.Surround Yourself with Success - You are the combined average of the five people you hang around the most. Surround yourself with healthy, success-minded achievers. 6.Model Success - The best way to learn to be successful at anything is to find someone who is where you want to be and model their success habits. 7.Master the Fundamentals – Don’t complicate it. About a half a dozen things make up 90%+ of what it takes to be successful at anything. Keep it simple. 8.Get Fit - The mind cannot achieve what the body cannot perform. Your family, friends and career and future depend on your good health. Make it priority No. 1. 9.Remember What’s Important – At the end of the journey what will have mattered most will be your relationships – the people you love and those that love you. Make sure they are on your goal list for 2008. 10.Make a Difference – What do you want your life’s legacy to be? You have the power to make a positive difference – to a single person, a neighborhood, a community, a nation, the world. Realize that power in 2008. Thank you for the tremendous number of inquiries asking for updates to "The Pulse" and how much you have enjoyed past issues. I appreciate your comments very much. 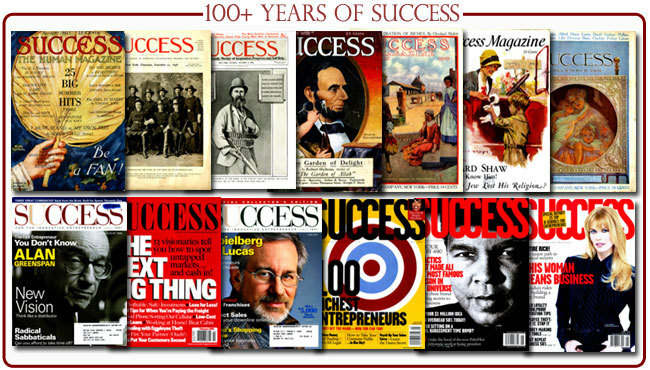 I am now the Publisher and Editorial Director to SUCCESS magazine - the iconic publication which has profiled the extraordinary achievers of our time for over a 100 years. Previous people who have sat in this chair as Publisher/Editor before me include Napoleon Hill, W. Clement Stone and Og Mandino so it is an honor for sure. We are completely redesigning and upgrading the quality, image and depth of the magazine - creative design, photography, editorial and end product look and feel. The objective is to return the publication to its roots as the preeminent and premier personal development magazine – “What Achievers Read”. More information to follow (and a new blog design too!). Holy Toledo! (or something like that ;-) ) was what I said when I got my final bill from a lawyer I used on a recent transaction. You know what personal development practice they have mastered… probably better than you and me? Valuing their time. They charged me for every lunch, brief huddle, phone call and email… yeah every email! THAT is the kind of time value awareness we all need to have. Having an income oriented association with how you spend your productive time. What is your annual income goal? Let’s say it is $150,000. > Spend an extra 15 minutes at lunch – pull out a $20 bill and tear it into pieces. > Chat with a friend for 10-minutes during your work day – that just cost you your lunch money. > Leave an hour early because it’s Friday – take out 3-$20s, 1-$10 and a $5 for the privilege. That is what wasting time costs you, but so does confusing “activity” from productivity. Every day you need to ask yourself – what am I going to do today that will earn $600 or more? During every hour you need to ask yourself – am I producing $75 in results? If not, that is why you will fall short of your annual income goal. It is your vigilant discipline of producing $20 worth of work (every 15 minutes) that will magically materialize your $150,000 annual income. WARNING… you might be successfully failing! 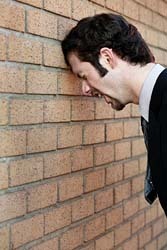 Even a finely tuned and designed Ferrari will fail if headed into a brick wall. I recently participated in a facilitated strategy session and one concept introduced by the facilitator Ben Rasberry from MAP was particularly compelling. 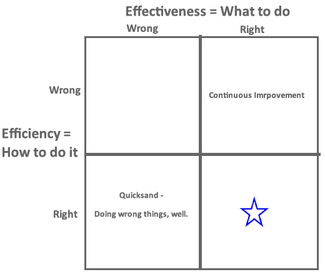 It is an analysis between Effectiveness and Efficiency. What if you were doing the WRONG things RIGHT? A. Unsophisticated managers, accounting is done by hand, transactions are entered manually, the owner doesn’t even use email, not automated, paper driven operations, but they are very successful and make a tremendous profit. B. An incredible stable of talent, bleeding edge technology, operationally efficient, flawless and relentless execution and the business fails miserably. Even while companies in Category A might operate sloppily and execute inefficiently, they are doing the right things in their business. That could be their UVP (Unique Value Proposition), business model/positioning, focus on sales and revenue, world-class customer service or attention, etc. It is more important to be sure you are doing the right things than the wrong things well. 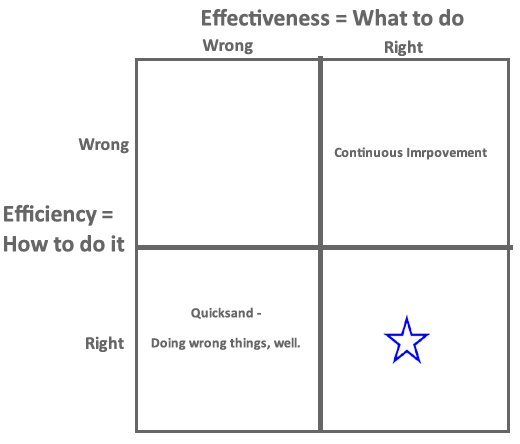 Focus on Effectiveness, your business strategy, the core drivers of your business than getting lost in trying to optimize the minutia of your day-to-day operations. Remember to work ON your business rather than only IN your business. In Japan executives are required to DO less and THINK more. Step away from the busyness of your business from time to time to evaluate if you are driving your Ferrari in the right direction. If it could be hard or easy, which would you choose? Seem like an obvious or even a stupid question to ask? Maybe not since most of us end up choosing to do things the hard way. We continue to mash our head against the wall wishing it were a door and complaining about the headaches and the blood running down our face. I recently saw the movie Way of the Peaceful Warrior from a favorite book of mine by Dan Millman. Of all the good messages intertwined in the story, I found one particularly compelling as it is not often how we assess our approach to life and situations. This is the money line: "The wisdom of life is learning to apply the right leverage in the right place at the right time"
1. Don't respond to force with force. I know I am the poster child of this mistake. I tend to meet force with force. If I run into barriers, blocks or resistance, I fight harder. Sound familiar? This has been the cause of some of my biggest foibles and heartaches. I am wiser now (most of the time! :-)) I am a believer in persistence and determination, but I have found there is a balance between healthy persistence and bludgeoning your head against a dead end. I see many goal obsessed people also make this mistake. They become too fixed on obtaining their arbitrary goal... many times at sacrifices far too great. Decide what is important to you, what your core values are and what direction you want your life to go in, then be flexible and pay attention to what shows up. I have seen people miss out on bigger opportunities and richer experiences in life because they were too fixed on their original goals. Set your intentions, move in that direction and pay attention to what shows up and find ways to leverage it and propel you into achievements and happiness you never even imagined during your goal writing session. 2. Find and use your internal leverage. What are your unique talents? What is easy for you to do that is typically difficult for others? What knowledge or insight do you have that others don't? Are you using that leverage? Are you in a business or profession that is utilizing your personal gift (your leverage)? You have an advantage in life. There is something you do better than most people. That is your unique leverage. Problem is most people are in jobs or businesses that aren't centered around or focus on that particular strength. This is a really important point. 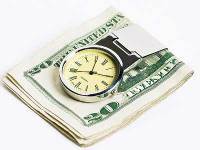 It is easy to mixed up in all sorts of tantalizing ventures or investments that you should probably not be wasting your time or money in. Once you get clear on what your unique talents are, what your personal leverage is, don't bother unless you get leverage – your personal leverage. If it is hard for you, it is probably not for you. Start focusing on what is easy for you - that is where your leverage lives. There are hundreds of examples of people and companies that get called "lucky" being "at the right place at the right time". Well, there were hundreds or thousands of others who were also there at that time, but weren't paying attention and did not act on this new found leverage. Constantly be looking for leverage. The magic is paying attention and finding your leverage in life. Then knowing how to apply it to the right places at the right times. That is the path to making great achievement and grand happiness easy, rather than hard - leverage. Good article by Jeffrey Gitomer below. I have abridged it to hit the high points. Don’t have your business go on vacation with you. 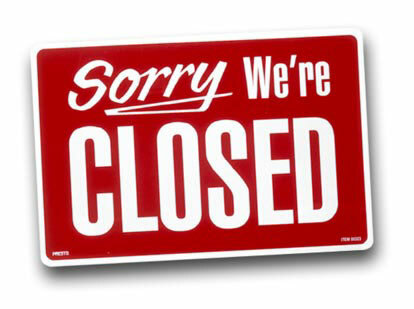 Ever send somebody an email and it bounces back, telling you that the person you sent it to is “out of the office”? I get emails every day from people telling me they’re at a seminar, on vacation, out of the office for two days, home sick, or worse, that their spam blocker needs confirmation. Quit doing this. You’re making your customers mad at you. And you look like a fool. Stop it. Suppose a customer is trying to place an order, and they get your stupid reply that you’re “on vacation, please call Mary.” And they call Mary and she’s “either on her phone or away from her desk.” So the customer decides to call the competition because you are unavailable. Your customers could care less where you are or what you’re doing. They just want help. There are several options for being able to serve customers when you’re out of the office or either on your phone or away from your desk. All of which require thinking, communicating, and serving the customer. I’m out of the office more than 250 days per year and somehow manage to handle and reply to more than 200 emails a day without a BlackBerry. I have a cell phone where I can receive phone calls when I’m available, or text messages from people who genuinely need me. I have a laptop with a wireless card and an internal airport device so that I can get online virtually anywhere in the world, at my convenience. 5.5 Delegate to co-worker or hire an assistant. When someone sends you an email, in most cases they expect a reply within 24 hours. Sometimes within an hour. If your customer wants an immediate response, and you immediately respond with a message that says, “I can’t respond right now,” that doesn’t help the customer. In fact, it negatively impacts the customer’s feeling about you. If customers need an immediate response then you should internally forward your emails when you’re away so that they can be responded to personally, or have someone checking your email while you’re away. MAJOR CLUE: The customer doesn’t need to know what you’re doing, or how you make it happen – they want a response to THEIR situation, not yours. I’m certain that a small percentage of people reading this will not appreciate the cold slap in the face. They’ll keep their idiotic, self-serving auto reply as part of their standard operating procedure. Here’s the good news: There are some people who will totally appreciate it: your competition. Jeffrey Gitomer is the author of The Little Red Book of Selling and The Little Gold Book of YES! Attitude. President of Charlotte-based Buy Gitomer, he gives seminars, runs annual sales meetings, and conducts Internet training programs on sales and customer service at www.trainone.com. Watch "Sales Rants" by Jeffrey as well. “IT” is not the problem… uh, it’s YOU. I’ve been exposed to several whiny conversations of late. Conversations where friends or colleagues have blamed other people, circumstances or the need to have "something" happen before things get better. I pulled this article up and sent it out to those few of people whom had temporary lapse self-pity and it seemed to heal them so. 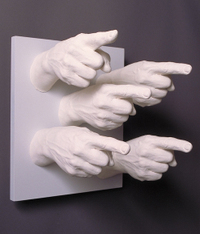 We all can get caught pointing a finger or two or barking an occasional cop-out. When you feel a finger rising to explain a misstep or justification to why you are not living as your Best Self, give the article below a read. One of the first things successful people realize is the old adage, "if it is to be, it is up to me." This doesn't mean that you do it all alone. It simply means that you take responsibility for your life and your career. The fact is that nobody else is going to do it for you, you must do it yourself. Now, some people may say, "Jim, that's a lot of responsibility." Friends, that is the best news you can ever hear. You get to choose your life. Hundreds of millions of people all around this world would give anything to live in the situation you do just for the chance to have the opportunity to take control of their destiny. "It is up to you" is a great blessing! 2. You can reap what you sow. Sleep in and go to work late and reap the return. Or get up early and outwork the others and earn a greater return. Place your capital at risk and earn a return or place it at greater risk and perhaps reap a greater return. You decide what you will sow and thus what you will reap. Now here is what YOU can do – Change the World! Listen to this live performance by Eric Clapton as he inspires you to do just that.